Ramps are really special. If you see them at your market, I highly recommend you snap them up. They’ll be gone in a minute. Seriously, their season is so short, about 3 weeks in total usually. And they can be hard to find if you live outside of the South Carolina to Canada Eastern corridor. But most of all, their flavor is something to behold. They are a perfect blend of sweet, garlicky, and oniony. I think a risotto is a perfect place to showcase their flavor. Here I pair them up with another star of the spring vegetable season: delicate asparagus spears. If you can’t get your hands on ramps, this recipe should not go to waste. 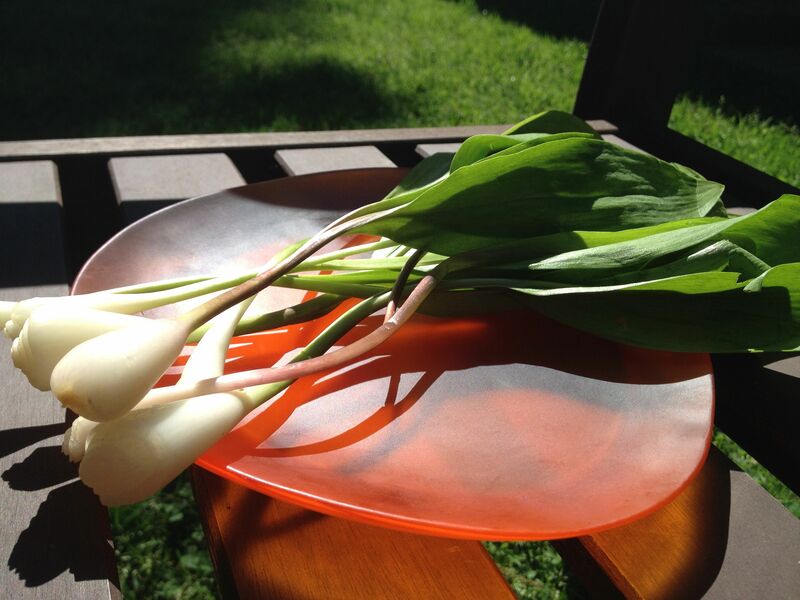 Leek or scallion can stand in for ramps when they are not in season. In a medium saucepan, melt the butter with the oil over medium-low heat. Add the ramps and cook until tender, 4 to 5 minutes. Add the rice and cook, stirring, about 1 minute to coat the rice all over with the ramps and butter. Increase the heat to medium, add the wine and cook, stirring, until absorbed, about 2 minutes. Add 3/4 cup of the warm stock and simmer, stirring, until the liquid is absorbed. Continue adding the stock in 1/2 cupfuls, stirring at a low simmer and letting the liquid absorb before adding the next cupful. Cook until the risotto is al dente and still quite soupy (it thickens up on the plate so when it is on the heat, you want to make sure the mixture is still quite loose and liquid), 15 to 20 minutes in total. Stir in the asparagus and cheese, season with salt and pepper and remove from the heat. Finish the risotto with the parsley and serve immediately with a green salad. This entry was posted in main and tagged asparagus, ramps, risotto. Bookmark the permalink.